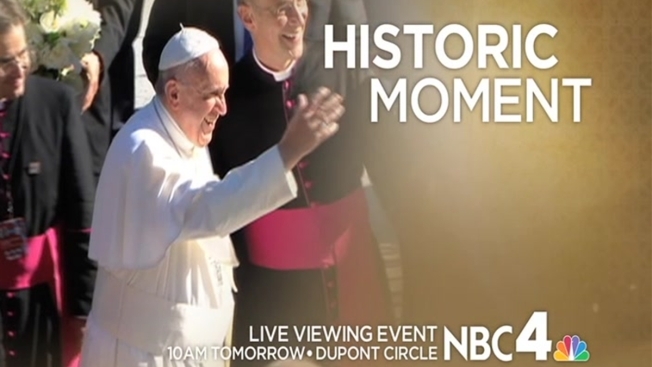 Watch live from Dupont Circle as Pope Francis addresses a joint meeting of Congress. NBC4, in partnership with the Dupont Festival, will have a Jumbotron set up at Dupont Circle so you can see and hear the pope's message to lawmakers at 10 a.m. Thursday. The address will come on the pope's last day in Washington before he leaves for New York City. Pope Francis arrived at Joint Base Andrews on Tuesday afternoon, starting his historic six-day trip to the United States. He arrived from Cuba at about 4 p.m. Tuesday, landing at Joint Base Andrews, where he was greeted by a delegation including President Obama and First Lady Michelle Obama. On Wednesday, he'll attend an official welcome ceremony and meeting with President Obama at the White House, followed by a trip around the White House Ellipse which will allow the public to catch a glimpse of him. Pope Francis will then attend Midday Prayer with the bishops of the United States at St. Matthew's Cathedral; at 4:15 p.m. Wednesday, he will preside at the Mass of Canonization of Junipero Serra at the Basilica of the National Shrine of the Immaculate Conception at the Catholic University of America. Thursday morning, Pope Francis will address the joint meeting of Congress. Jumbotrons showing the speech will be set up in a special viewing area on the National Mall as well. He'll then visit St. Patrick in the City and meet with staff and clients of the Catholic Charities of the Archdiocese of Washington before departing for New York in the afternoon. The Pope's Schedule of Events in D.C.